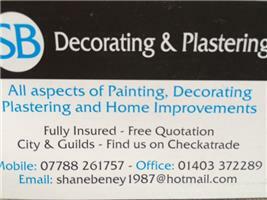 S B Decorating & Plastering - Painter/Decorator, Plasterer based in Southwater, West Sussex. AS SEEN ON SARAH BEENIE'S SELLING HOUSES! SB Decorating & Plastering have over 10 years’ experience in all aspects of residential and commercial decoration and plastering. We offer a reliable, clean and professional service for a reasonable price. Our main aim is to turn your "house into a home" for a fair price, we offer a very high quality service and pride ourselves on customer service. Based in Horsham, we cover all areas of East and West Sussex and Surrey and would be happy to provide a free no obligation quotation upon request.